Gail J. Stearns is The Irvin C. and Edy Chapman Dean of the Wallace All Faiths Chapel and Associate Professor of Religious Studies at Chapman University. With Professor Julye Bidmeand, Dr. Stearns is editor of Invest Your Humanity: Celebrating Marvin Meyer (Wipf & Stock 2015) in honor of Meyer, the renowned Gnostic Gospel Scholar. She is also the author of Writing Pauline: Wisdom From a Long Life (Hamilton Books, 2005) and Open Your Eyes: Toward Living More Deeply in the Present (Wipf & Stock, 2011). An ordained minister of the Presbyterian Church (USA), Gail also holds an interdisciplinary Ph.D. from Washington State University, with emphasis in gender theory. She is an Associate Professor of Religious Studies, and has previously taught university courses on world religions, ethics, spirituality and gender. Dr. Stearns works with students, faculty and staff at Chapman University. Through Chapman’s beautiful Wallace All Faiths Chapel, she brings together persons and organizations from many faiths throughout Orange County. She fosters interfaith celebrations and gatherings, as well as academic conversations in the areas of faith and religion. These include such topics as the scientific and religious study of Consciousness, and conversations in Religion and Economics. Gail is available for preaching, speaking, and retreats on interfaith cooperation, or on spirituality and mindfulness. Dr. Stearns most recent work is as a teacher of Mindfulness, a meditation that cultivates present awareness, helps to reduce anxiety, and fosters compassion. 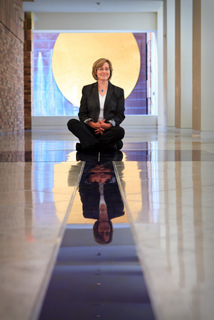 She offers mindfulness meditation introductions at Chapman University and in the community. "New dean of the chapel focuses on interfaith community service"
"Building character at Chapman University"
"Interfaith gathering celebrates Fish Interfaith dean at installation ceremony"